Thief Town is a local multiplayer stealth party game for up to 4 players. Stab your buddies in a pixel-perfect rendition of the Wild West! Lurk in the crowds, emulate non-player characters, and achieve backstabbing victory. With multiple game modes, killer tumbleweeds, deadly traps and spooky ghosts, you’ll have a stabsational good time with your friends in this exciting new party game! Yee-haw!! 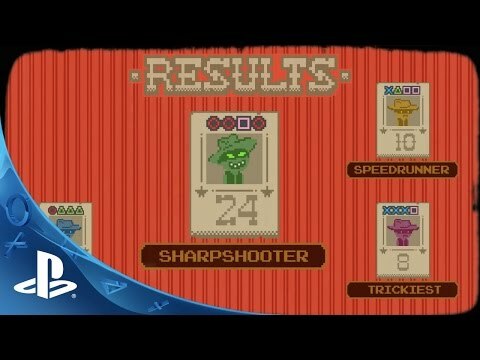 PlayStation 4 exclusive content - retro game filters, touchpad support for a more realistic stabbing experience, and an open-ended PlayStation-themed naming system. Thief Town – The classic backstabbing adventure. Players disguise themselves and stab their buddies in the midst of sandstorms and killer tumbleweeds. Spy Town – Players are given items to trick and trap enemy thieves. Smoke bombs, motion detectors, and teleportation devices... Be careful, they’re one-use only! Drunk Town – One randomly selected player (the "Sheriff") must identify and shoot the other knifeless drunks before running out of bullets. Copyright 2015 Glass Knuckle Games, LLC. All rights reserved.